Ok, so it may only be September, but the weather is turning colder and the leaves have started to fall, so I have been thinking about this years Christmas sessions! I am so excited to be offering studio photo shoots this year - something I have never done before, and so I needed something a little bit special as a backdrop. 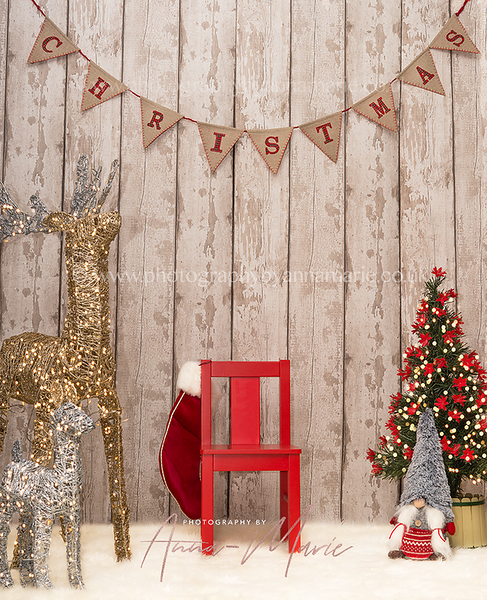 Annnnd, I am excited to share with you the first look at my Christmas set up for this year! I wanted to go for something natural but a little bit rustic. The reds and glitter of the tree and reindeer add to the Christmas theme, and it is somewhat magical! Come and join me for a festive weekend, where you will also receive a very special Christmas treat for your dog/child, sing along to Christmas songs and eat mince pies! These will look wonderful with your little ones and will make the perfect Christmas cards. My Christmas sessions will be available for dogs, cats, small animals, and children. These will last 30 minutes and take place in Yate, North Bristol. I have only one weekend where I am doing the Christmas photo shoots and that will be the weekend of 10th and 11th November. Once they're gone, they're gone! I have a few packages available so please contact me if you have any interest in these sessions. I expect them to book quickly, and I have a limited amount of slots available, so please get in touch soon. I will have a variety of prints and products on offer after your session, including Christmas gifts and Christmas cards. Outdoor Christmas sessions will still be available, so please do get in touch if you would like a studio photo shoot or a location shoot.